Love this photo. As an ex-surfer, I know that feeling of being in the moment, when nothing else seems to be with you. Just you and the surf. Thank you !!! She just drew me in and I watched her for what seemed the longest time. She was so lost in wherever she was she never noticed me at all. It sounds like a great feeling. I always envy surfers for their affinity with the sea, I’m hopeless in the water – I can swim a bit but don’t like going under 😦 This is a really cool image, I bet the girl would love it. Me too Gilly. I think that’s why I had a thing for surfer dudes when I was younger. They were so lost in what they were doing…i wanted a piece of that feeling. 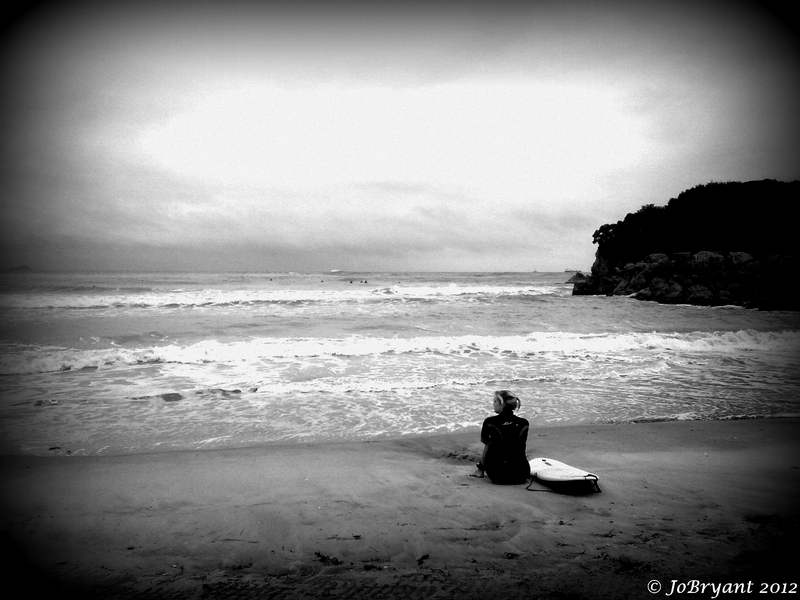 Thanks Ioanna…it was a really beautiful moment…watching her watching the sea. Love this photo. I remember the hydrophobia which I’ve got near hoogly river. Fantastic feel Jo! And the black & white captures it very well. I use the ‘vignette’ option in Picasa for the dark, soft outer edges. I love that effect for some photos. Thanks Madhu for the lovely comment. After seeing your entry for this one I feel very honoured that you say so. Thanks Barb. I couldn’t resist taking her photograph…she really caught my attention just sitting there. Very solitary … Fantastic shot. Thank you. That is exactly how she felt. It was like she was protected by some sort of bubble of consciousness. I can sense the longing for isolation, the yearning to escape hard ground, to live in and on something that is wild with out boundaries in this one. The image evokes so much more than just what is in the frame. I started my morning looking at this, thanks big time! Awwwww…Hudson I can’t tell you what your comment did for my morning. Thank you…you just got it completely and you made my Sunday morning perfect. Great image. I love the processing and the way the wind is blowing the hair. Beautiful! Thank you Angelia. I really love that you enjoy those aspects of the image. wow! great photo, Jo! Captures the theme perfectly!!! Thanks Stephen. When I saw the challenge I knew immediately what image I was going to use. That girl has stayed with me ever since I took that shot. WOW – that is such a terrific compliment coming from Miss Wow herself. Thanks Angeline. Thanks a heap. Awwwww…you’re so sweet Russell. Thank you. I took this a wee while ago but had not done any editing with it until this challenge. But as soon as I saw the word SOLITARY I knew what image I wanted. She has never left my brain…so I edited it and I am really happy with this one actually. Last Thursday night when I was at the opening of the yearly local art exhibition I actually agreed to have an exhibition in my little town in February of some of my images and this one is looking like a likely candidate. What do you think ???? Blown up I think she’d really be mesmerizing. Thanks. I think I am insane for agreeing. Looking at the beautiful photo, I can feel the peacefulness. It was peaceful just watching her and the other surfers that were in the water. I could do that for hours Amy. It was actually very peaceful Hook, watching her watch the ocean. Zen like. The beach is easy to love…glad you like it. Nice shot. I like the effect, like looking through a telescope or binoculars. Really works well for this photo and topic. Thanks Sue !! I love the way you describe it. Great pic… and black and white is always timeless. Looking good over here. Sorry I haven’t been by in awhile and just noticing. Why thank you on both counts. You are welcome… sorry I haven’t been visiting as much as I would like. Yes true, But my life has been work since we returned. Just when you think you are caught up or have free time something else is comes up. We don’t do things gradually it is always full on! Thanks AD. I love that you think so. Yea…that’s what I was going for. Great shot! I always find the ocean to be a place of solitude! Thank you…I agree with you there. She looks at peace with life. She does TBM…she sat there for the longest time. Nice shot. Captures the solitary mood. Thanks. Thanks Ron. She was wonderful to watch. Thanks BB. That is lovely of you to say. That is a lovely comment. Thank you. I can’t surf either Sarah…always glad to watch others do it though. She certainly was…and so lost in it. There Gay lol!Love your picture really peaceful looking. Glad you like the image though. Think she meant They’re gay… from your comment prompt…. Ohhhhhh…yes I like that way of looking at it. Great image, Jo! And the black and white treatment somehow amplifies the feeing of solitude. Lovely. Thanks…she was fun to try to capture. Now that is a great shot. 😉 Love the back and white too. I’ve loved the reaction to this image because it is one of my favourites. GREAT shot! I can FEEL the solitude. Awesome. Thanks Tahira…it is a favourite image of mine, so I love when people like it.